Alberto here. Today’s letter is “Y” and that stands for “Yowl”. Please pull up a seat and allow me to explain this word from a feline point of view. As all of the Tribe has some Siamese in us, we do have a tendency to talk but we object to the word yowl. Yowl means “a loud wailing cry, especially one of pain or distress.” When you humans use this word to describe every sound we make we are offended. Sometimes (usually in the wee hours of the morning) we like to stand outside your bedroom door and sing the song of our people. This is singing not yowling. Sometimes we just want to get your attention or have a short little chat, this is talking, not yowling. Felines yowl when they are in dire circumstances. If your felines are communicating with you vocally, please use the proper adjective and do not state that we are yowling. This public service announcement has been brought to you by The Tribe of Five on behalf of the felines of the world. Tucker here. Today’s letter is “X” and that stands for “X-RAY” , as in X-ray eyes. Any of you humans who live with felines are furmaliar with that x-ray, mind controlling stare we employ to get you to do our bidding. Every feline needs to master the art of the stare as this is the first step in training your Humans. Tucker: this is my x-ray stare technique, looking cute and maximizing my crossed blue eyes to their best advantage. How could you refuse anything this sweet face asks?? Oliver: I use the “You’ve got to be kidding me!” x-ray eye technique. After a while, the Humans will realize they are being judged and found lacking and they will cave. Alberto: My x-ray eye technique is a bit on the snarky side. I have this certain look that I will maintain. Soon enough the Humans begin to feel they have done something I find egregious and then they will begin to attempt to find out what it is that I need. It’s Tucker. Today’s letter is “W” and that stands for “WELL FED”. Now you may think I’m talking about the Tribe of Five and yes, it’s true, although we are very well fed (just look at Oliver’s physique) but I’m not talking about us, I’m talking about the woodland moochers that show up with their babies every spring. The Female Human loves all of God’s creation and she can never say no to Mamma and her little ones. What does she feed them you ask? Cat food! What hubris! Gee, it looks like I’m getting all the letters this week! It’s Oliver again and today’s letter is “V” and that stands for “VERY GOOD ADVICE”. Our Female Human has two things on the wall of her office that are the best pieces of advice for everyone. They are “write yourself a happy ending” and “Dream”. The Tribe of Five agrees this is very, very good advice! It’s Oliver again. Today’s letter is “U” and that stands for UNDERNEATH. I am a feline that loves to crawl underneath stuff so if you come to our house to visit, please make sure you check for lumps under the chair cover, sofa throws or throw rugs. Oliver here and I’m taking today’s letter which is “T” and that stands for “TALKING” as in talking cats. I hope you enjoy my little message. Hi there folks, it’s Alberto and Oliver today opining on today’s letter which is “S” and that stands for “SNOOPERVISING” . 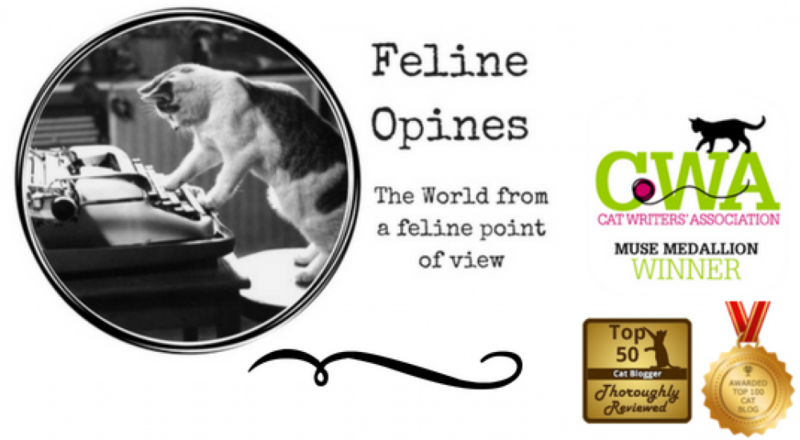 We have written about snoopervising and it’s a job every feline should take seriously. We provided instructions and tips about one area of snoopervising on our blog. Our humans shouldn’t be left alone as they often get into trouble so we urge you to take your job of snoopervising seriously! Human, you really need to blow the fall leaves off the porch before the snow!